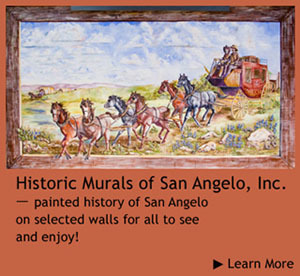 Historic Murals of San Angelo, Inc. is an exclusively charitable and educational organization. We work to promote community pride, combat community deterioration, and preserve and rehabilitate buildings of historic and architectural significance. Like many organizations, HMSA began with the vision and dedication of a spirited individual. In 1997, Susan Morris brought her passion for civic duty and an extensive background in the development of historic murals to San Angelo. After becoming a member of Historic San Angelo, Inc, she proposed a plan to install murals to revitalize the downtown area and obtained the support of that organization to move forward on the idea. In 2002, "The History of Transportation in San Angelo" became the first mural sponsored by Historic Murals of San Angelo, Inc., with the help of 16 major donors who contributed between $500 and $5,000 each. Their generosity and the growing support of the community allowed HMSA to demonstrate how historic murals could enhance San Angelo. We welcome your contributions to keep HMSA's vision strong for generations to come. To provide our current population and future generations with a clear, valid understanding of the history-rich legacy of our West Texas forefathers. Via murals, expose as many people as possible to the history of San Angelo. Thus, hopefully, spark the viewers' desire to learn more of San Angelo's wonderfully intriguing background. Our artists use potassium silicate mineral paint brought in from Germany. It is used around the world for masonry painting of buildings and murals. Murals you see on buildings throughout Europe were painted with potassium silicate mineral paint in the 1800's and are still beautiful today. Historic Murals of San Angelo, Inc. made the decision to use this paint because we wanted the time, effort, and money invested in producing these murals to assure they will be here for many years to come. Stylle is Lone Star, tried and true. Born in Lufkin, Texas, he traveled to Tyler and Fort Worth before settling in the dusty outskirts of Cleburne. He discovered his talent and love of mural painting while attending college at the University of North Texas at Denton. Stylle comes by it naturally, having been born into a family surrounded by art. His artist father, Sleepy Read, paints abstracts and modern art in addition to rural Texas landscapes. Stylle has 35 years of experience painting professionally. History has always been a favorite with Stylle. His love of the Old West time period is apparent in his many infamous western scenes. 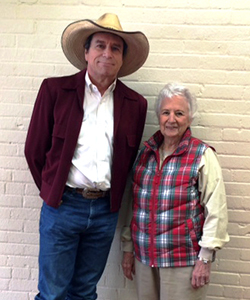 Stylle recently became a 2015 inductee into the Texas Trail of Fame for the Fort Worth Stockyards. Crystal, a self-professed military brat, grew up studying art and visiting art museums while her father, also an artist, was stationed in England and Europe. “I grew up smelling paint and turpentine,” she says. She moved back to San Angelo from Austin, where she painted numerous murals in homes and outdoor art in the Austin area. Her artistic talents as well as her interest in researching history and teaching art to children have added a special dimension to her outdoor art in San Angelo.